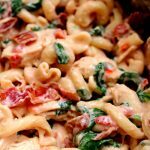 Curly pasta is enveloped in a creamy sauce with tender bites of chicken, crispy bites of bacon and a green pop of color from spinach or broccoli. A one pot pasta dish that rivals anything you can order at a restaurant. There are two methods of making this pasta. The first way you cook the chicken breasts whole and then slice them. This method is nice if you have frozen chicken breasts and you don’t want to thaw them. I believe that this method lends itself to juicier chicken breasts. This method you’ll need to cook your pasta using the pot-in-pot method. I used this pan* to cook the pasta. The second way takes less cooking time because you cut up the chicken first and it cooks quickly. Add a half cup of water or chicken broth to the bottom of your Instant Pot. Add in the chicken. Lightly salt and pepper the chicken. Pour the pasta into a pan* that fits inside your Instant Pot and then add 4 cups of chicken broth into the pan. Cover the pan with foil. Lower the pan on top of the chicken using a sling or a trivet* with long handles. Cover the pot and secure the lid. Make sure valve is set to sealing. Set the manual/pressure cook button to 10 minutes (for thawed chicken) or 12 minutes (for frozen chicken). When the time is up let the pot sit there for 5 minutes (display will say L0:05) and then move the valve to venting. Open the pot. Use hot pads to carefully remove the pasta pan. Set it aside. Remove the chicken and slice it up on a cutting board. Discard the cooking liquid in the Instant Pot. Pour the pasta back into the empty Instant Pot and turn the Instant Pot to the saute setting. Add in the garlic powder, ranch dressing mix, diced tomatoes, cream cheese and milk. Stir and let the cream cheese melt. Once the cream cheese is melted and incorporated add in the chicken, bacon, spinach or broccoli (see note) and parmesan cheese. Stir until spinach is wilted down. Taste test and add salt and pepper to taste. You may also want to add in additional milk to make it a looser consistency. Cut your chicken into bite size pieces. In the order listed add chicken, pasta, 3 1/2 cups broth, garlic powder, ranch dressing mix and diced tomatoes into the Instant Pot. Don’t stir. Cover the pot and secure the lid. Make sure valve is set to sealing. Set the manual/pressure cook button to 3 minutes for pasta with more bite and 4 minutes for softer pasta. When the time is up let the pot sit there for 5 minutes (display with say L0:05) and then move the valve to venting. Open the pot. Turn Instant Pot to the saute setting. Add in the cream cheese and milk. Let the cream cheese melt, stirring often. If the sauce is too runny you can make a cornstarch slurry (stir 2 Tbsp water with 2 Tbsp cornstarch until smooth and then add mixture to the pot). Once the cream cheese is melted and incorporated add in the bacon, spinach or broccoli (see note) and parmesan cheese. Stir until spinach is wilted down. Spinach or broccoli: I used fresh baby spinach and just stirred it in at the end. You could also use frozen spinach that has been thawed and squeezed of excess moisture. If you’re a broccoli fan you can stir in broccoli florets at the end as well. The broccoli can’t be pressure cooked with everything else because it will turn into mush. You can use fresh or frozen broccoli. If you use fresh broccoli steam it first on the stove top or in the microwave. If you use frozen broccoli place it in a colander and run hot water over it for a couple of minutes. Shake it of the excess water and then stir it into the pot.